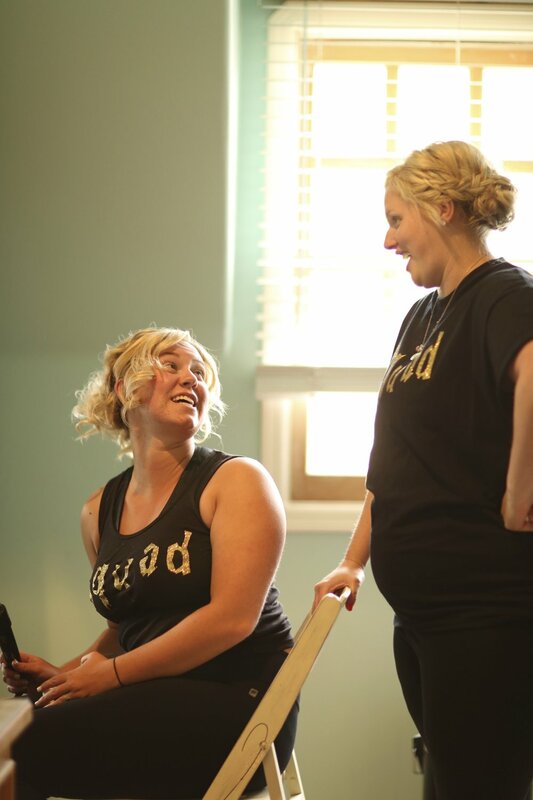 What is the most fun about being a bridesmaid? Brides and bridesmaids getting ready for the big day. The most fun about being a bridesmaid is the getting ready part. All the girls gathering together in the bridal suite, doing their make up, fixing their hair, talking about the big day, and helping the bride to look absolutely perfect. Primping and polishing, and creating beautiful masterpieces, it’s just one big party. For a professional look, hire a professional. A lot of headaches can be avoided if the bride hires a wedding professional to make her day. Even though this bridal party had four licensed cosmetologists including the bride, they knew how important it was to hire a professional when it came to doing their hair and make up. Tip: Make sure to allow plenty of time for your professional to work their magic..
Starbucks is a great way to start the wedding prep. The bride made sure everyone was taken care of in the beverage department. 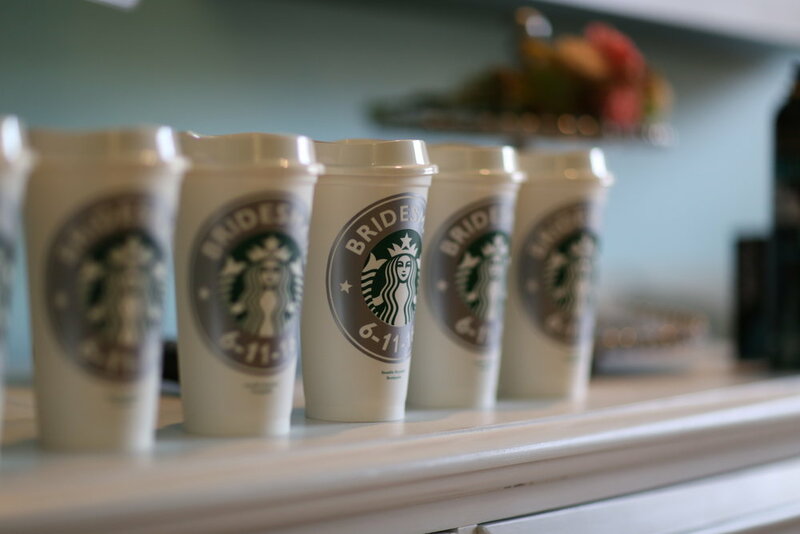 She had personalized Starbucks cups made for all of her bridesmaids. In turn, the bridesmaids created and wore cute tank tops that said “squad” on them, with the bride wearing one that said “Main Batch”. Wedding hairstyles, make up, and dresses make the bridal party. The bride had the cutest platinum hair color in a fashionable asymmetrical hair cut. She wore a veil with a floral treatment crown. The bridesmaids each wore a French braid styled hairstyle. 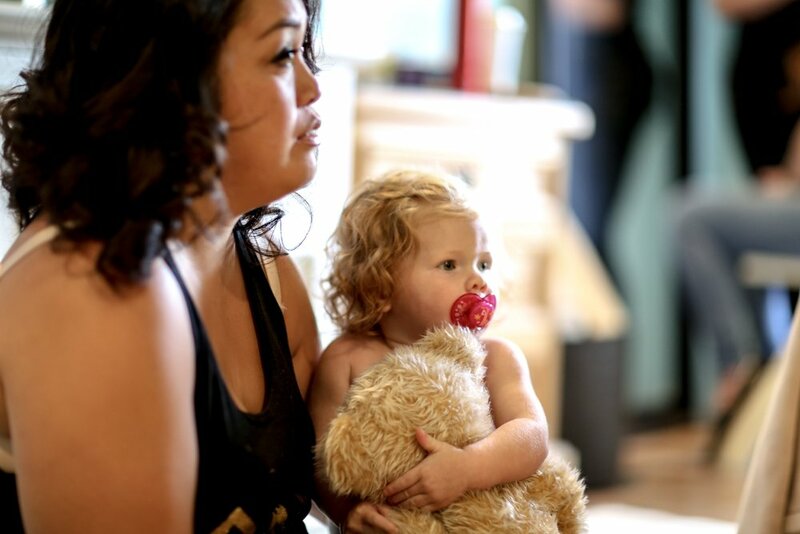 The maid of honor brought her darling little girl to be the flower girl. She was a show stopper in her frilly white tulle dress. This bride had a custom made wedding dress with hand sewn floral appliqués. 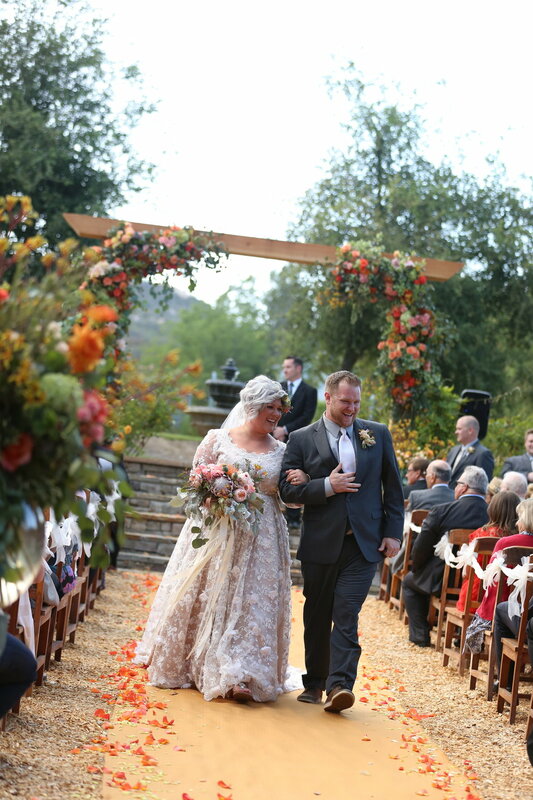 The brides wedding dress was a custom made gown that had hand sewn dimensional flowers sewn on the lace. It was a beautiful champaign color satin with a cream colored beaded lace. 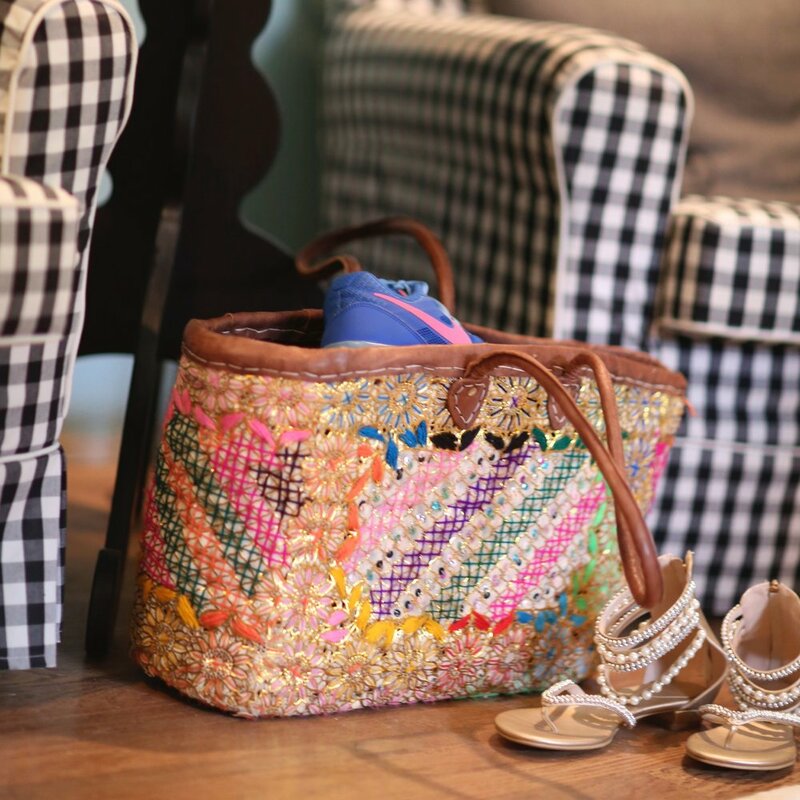 Her shoes were simple flat sandals with big rhinestones on them for the bling. The bridesmaids were mismatched, each wearing their own style but with the same light grey fabric. Kate Spade ear rings and a large bracelet were part of the bridesmaids gift given to them by the bride, and they each wore them during the wedding. 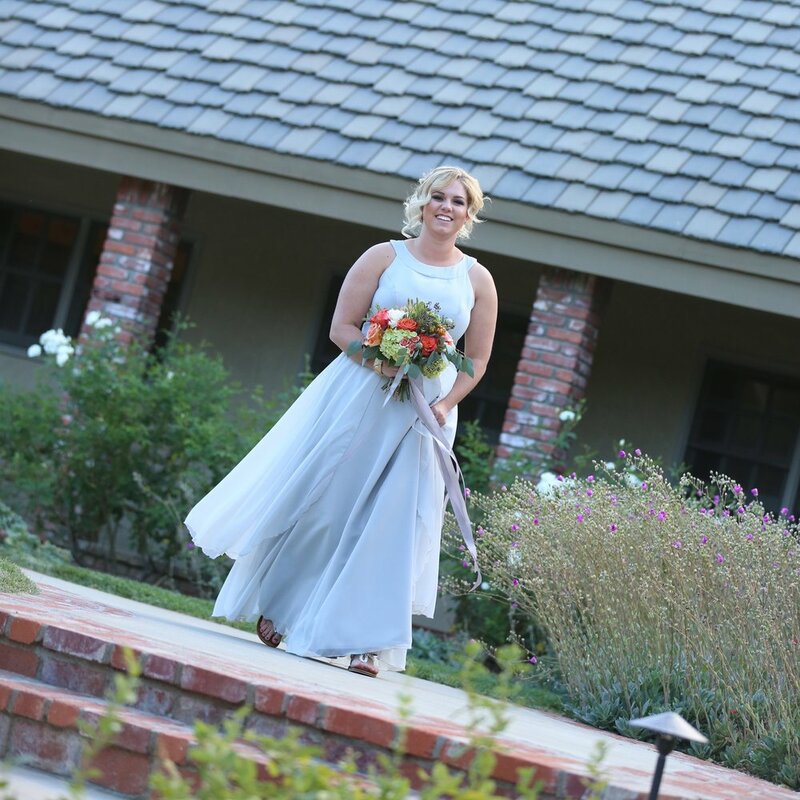 The beautiful Chateau Adare in Murrieta California was the perfect wedding venue. 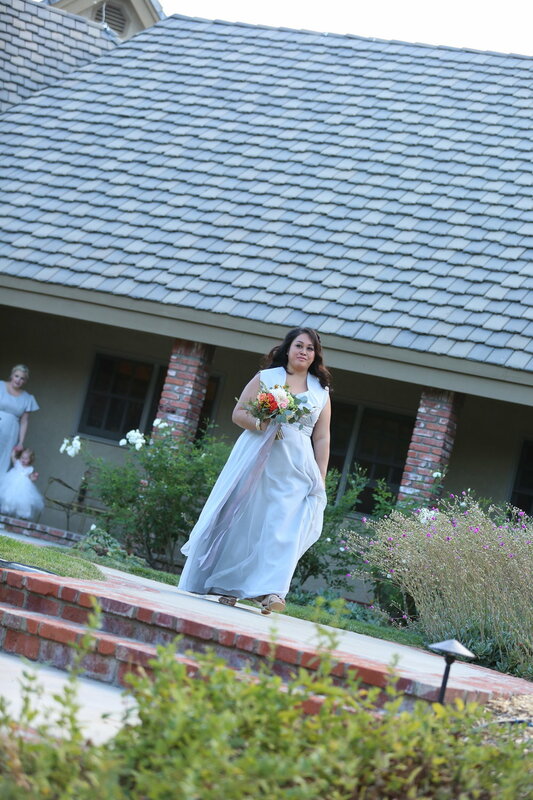 The wedding and reception was held at the beautiful Chateau Adare in Murrieta, California. We were lucky enough to have provided all the rentals for both the wedding and reception. The flowers were a Bleudog Floral creation. The brides bouquet was stunning with the juxtaposition of both peonies and king protea in an array of coral colors. The bridesmaids each carried a bouquet made of roses, hydrangeas, pods, and eucalyptus. All the preparations paid off and the bridal party looked amazing. All the primping produced the most beautiful bridesmaids and bride, as you can see. They had so much fun laughing and getting ready together. You could really feel the love they had for each other in the room. They all made sure this beautiful bride had a day she would always remember. And… this was the beginning of many wonderful things…. In case you are wondering, they were the birth of Birdie in a Barn.